July 11, 2:00pm to 2:50pm – Panel: Does Violence Kill the Romance? 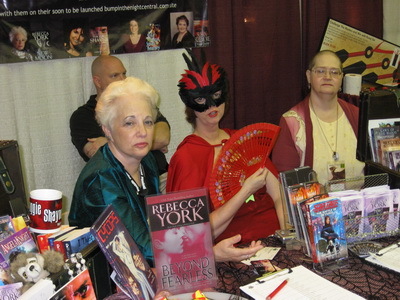 November 7, 2007 – 12:45pm to 1:00pm, Discussion of recent Rebecca York books and her career, Daily Cafe show, Retirement Living Television (RLTV). October 13, 2007 — 10:00am to 12:00pm, Talk, Maryland State Library for the Blind & Physically Handicapped, 415 Park Avenue, Baltimore, MD. October 15, 2007 – 1:30pm to 2:00pm, Booksigning, New Atlantic Independent Booksellers Association Fall Conference, Sheraton Baltimore City Center, 101 West Fayette Street, Baltimore, MD. October 29, 2007 – 8:30pm to ? ?, “The Horror and Paranormal Continues with Rebecca York and Maggie Shayne,” Interview at http://www.blogtalkradio.com/PHARRIS .